The Cruz Roja Carnaval Group is gearing up for another great season. They are a group of 76 volunteers who once-a-year man a Mardi Gras bead booth, accepting donations of $3, $5 or $10 (USD or the equivalent in Mexican pesos) for the Cruz Roja in exchange for a string of beads, or a Carnaval T-shirt. 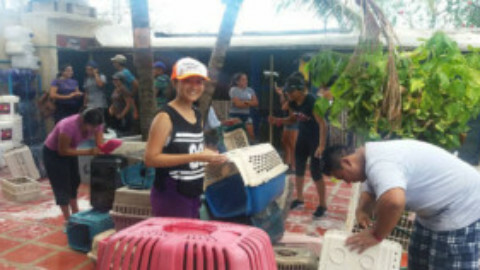 This is the group’s 5th year in action, and second project. 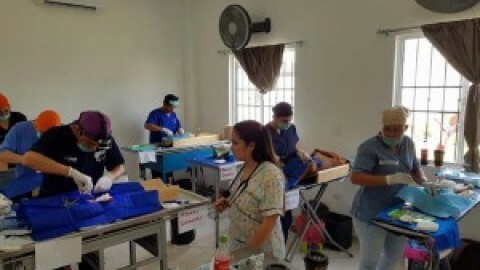 The first project, which took two years, raised enough funds for the purchase of a x-ray machine for the Cruz Roja Clinic; which has allowed them to provide this service low-cost to those who would not normally be able to afford it. Last winter, the Carnaval Group and the Airport Group combined collected over $9,000 USD toward the goal of purchasing a used ultrasound machine for the Clinic, reaching halfway toward the cost of a used machine, however, a very generous donor came along in recent months and donated an ultrasound machine to the Clinic and it arrived here last month. Now the group has an even bigger proposed goal: furnishing the waiting room/lobby of a proposed new medical office building which the Cruz Roja Board hopes to build on the Clinic’s property this year. Local doctors will have the opportunity to rent independent space, and these funds provide operating income and the ability to purchase equipment for the Clinic. There are several different opportunities to serve as a Carnival Group volunteer this year. We need strollers – volunteers who would like to work independently, taking beads to their favorite places of business, restaurants and friends, asking for donations. We also need a scheduled 7 to 10 PM stroller each night visiting the plaza restaurants. We will have our large bead board on the plaza Friday (February 28), Saturday, Sunday, Monday, and Tuesday (March 4) with shifts from 1 PM to 4 PM, 4 PM to 7 PM and 7 PM to 10 PM. Each of the evening shifts we really would like to have a male volunteer working, so if you are a couple, this is a shift we hope you will encourage your significant other to volunteer with you. The smaller bead board will be in the MEGA downstairs lobby Wednesday (February 26), Thursday, Friday, Saturday and Sunday (March 2). The shift choices at MEGA are 12 noon to 3 PM, 3 PM to 6 PM and 6PM to 9 PM. Marilynn Hrouda dmhrouda@msn.com for details. 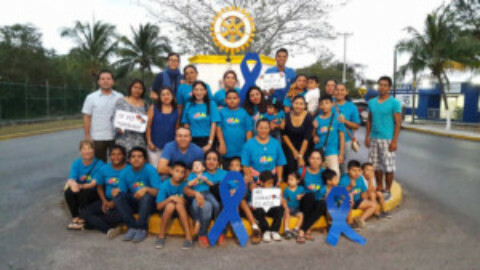 Club Rotario Cozumel – During the entire month of love and friendship, the Rotary Club is offering the world famous “Krispy Kreme” donuts for sale. These delicious donuts are available by pre-order only from any Rotary Club, Rotaract or Interact member. The price is $135 pesos for a box of glazed and $170 pesos for a mixed box. Place your orders now and they will be delivered on the 13th of February. Your purchase allows these very worthy organizations to support various projects around Cozumel. Additionally, the Cozumel Rotary Club is working in conjunction with Texas Rotary Club 5890 to help the Center for the hearing impaired, “Manos y Voces A.C.” If you’re interested in helping them remodel, and securing new educational equipment, please contact Alex Franco, alexfranco15@hotmail.com, a current Rotary member, or you can even contact them through facebook.